For many of us, water just flows or swirls and little do we realize what valuable functions and services it graciously offers and what consequences our water related choices and actions have. Safe and adequate drinking water and sanitation are recognized as basic human rights, as they are indispensable to sustaining healthy livelihoods and fundamental in maintaining the dignity of human beings. The recently launched UNESCO 2019 World Water Report highlights that over 2 billion people live in countries experiencing high water stress, while 2.1 billion people lack access to safe, readily available water at home. Many of these are in the Mediterranean. Without safe, accessible water and sanitation, these people are likely to face multiple challenges, including poor health and living conditions, malnutrition, and lack of opportunities for education and employment. Needless to say, ecosystems suffer as well. At EU level, the EEA State of Water Report issued in July 2018 shows that 74% of the EU groundwater bodies have by now achieved good chemical status and 89% of them have achieved good quantitative status. Sadly, the situation is less encouraging for surface waters; only 38% of them are in good chemical status and just 40% in good ecological status. 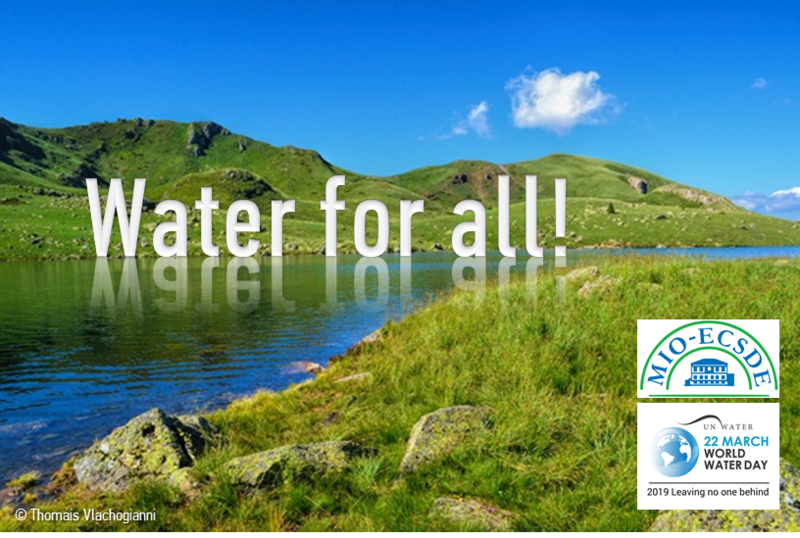 Sustainable Development Goal 6 is crystal clear: water for all by 2030. By definition, this means leaving no one behind. This World Water Day, 22nd March, is about tackling the water crisis by addressing the reasons why so many people are being left behind. Marginalized groups – women, children, refugees, indigenous peoples, disabled people and many others – are often overlooked, and sometimes face discrimination, as they try to access and manage the safe water they need. “Leaving no one behind is at the heart of the commitment of the 2030 Agenda for Sustainable Development. Those ‘left behind’ need appropriate representation in environmental decision-making processes. Within this context, MIO-ECSDE with renewed impetus will pursue its long-standing mandate in bringing forward structured and constructive Mediterranean NGO views in water related policy fora in the region”, says Anastasia Roniotes, MIO-ECSDE Head Officer. Some of MIO-ECSDE’s 2018 related highlights include its direct involvement in the elaboration process of the new UfM ‘Water Agenda’ in the Mediterranean; promotion of the Water Framework Directive and Integrated Water Resources Management in South-Eastern Europe; advancing the debate on the Water-Energy-Food-Ecosystems Nexus; raising the awareness of the educational communities on urban water and climate vulnerability and non-conventional water resources.